The debt-to-income (DTI) ratio limit for an FHA loan in 2017 is 43%, for most borrowers. In some cases, home buyers using the FHA loan program can have up to 50% debt-to-income, at a maximum. A higher level of debt might be allowed if there are certain “compensating factors,” such as a minimum increase in monthly housing costs, or additional cash reserves. That’s a quick overview of the debt-to-income ratio limits for FHA loans in 2017. Here’s a more detailed look at this important qualifying factor for borrowers. The front-end ratio looks at mortgage and housing-related debts only. This would be your monthly mortgage payments, property taxes, etc. The back-end DTI ratio considers all of your monthly recurring debts. This includes your monthly mortgage payment, in addition to any credit cards, car payments, personal loans, etc. Related: How much debt is too much? HUD Handbook 4000.1 states that borrowers can have a maximum qualifying ratio of 31/43. This means that a person’s total debts — including the mortgage loan — should use no more than 43% of monthly income. For example, if a home buyer uses an FHA loan that results in only a minimal increase in housing payments, then a higher debt level might be allowed. The same goes for borrowers with cash reserves in the bank and/or residual income left over after making their mortgage payments. In the table above, you will also notice a credit score column. This is an important detail, because it directly relates to the maximum debt-to-income ratio limits for FHA loans. The absolute minimum credit score for this program is 500. In order to be eligible for an FHA-insured mortgage loan, borrowers need a score of 500 or higher. To qualify for the 3.5% down payment, borrowers would need a score of 580 or higher. With regard to DTI limits, only those borrowers with scores of 580 or higher are allowed to have the higher debt limits. 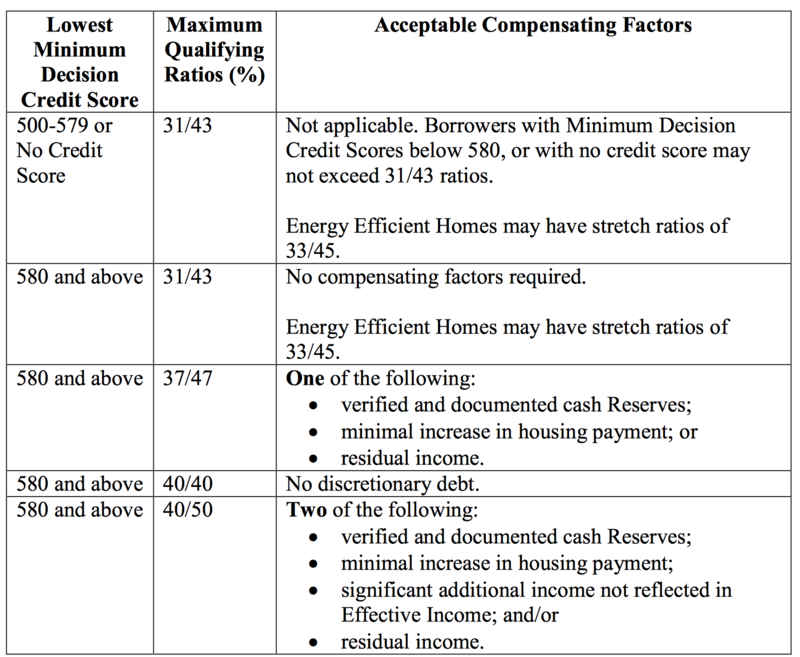 If you get approved for the program with a score between 500 and 579, you will most likely have to meet the 31/43 debt-to-income ratio limit shown in table above. If a borrower has a score of 580 or higher, and one or more of the compensating factors shown above, then he or she might be allowed to have a higher level of debt and still qualify for an FHA loan. Note: These are general guidelines applicable to most borrowers. Your situation could differ. A “conventional” home loan is one that is not insured or guaranteed by the government, which sets it apart from the FHA program. In the past, conventional loans have traditionally had stricter requirements for debt-to-income ratio limits. But that has changed over the last two or three years. These days, conventional loan programs are trying to compete with FHA by relaxing their qualification criteria. And this is true for DTI limits as well. In a recent article, we explained that Fannie Mae (one of the government-sponsored enterprises that buy mortgage loans from lenders) recently raised its debt-to-income ratio limit for conventional home loans. They now allow borrowers to have a total or back-end ratio up to 50%. Previously, they imposed a limit of 45%. The point is, you shouldn’t just look at FHA loans if you have a relatively high level of debt. Conventional (non-government-backed) mortgage loans are more forgiving these days, when it comes to the borrower’s maximum debt-to-income ratio. So be sure to explore all of your options when shopping for a home loan.